He seemed to be as one of those guys that carry his house in his bags with him. He got in the subway wearing his Vietnam veteran hat and walked, as in a mission, directly to the empty seats at the end of the car. But he did not seat nor did he leave his heavy bags down. 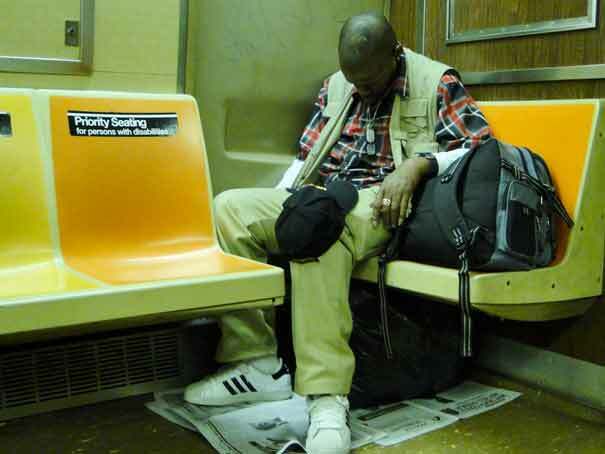 While he managed to balance the weight following the movement of the subway, he took out some napkins and hand sanitizers and carefully started to clean his seat. Not happy with scramming every border three times, once he finished he continued with the surrounding seats and the sidewall of the car. Only then he left his bags on the hygienic surface. But the task was not yet over. Still standing, he opened one of his bags and took out the Financial Times. After a couple of stations watching him, the last thing I was expecting -and I felt a little guilty for prejudicing- was him reading the Financial Times in his now sanitized environment. Well, he didn’t. The newspaper was the last sanitizing dispositive. He squat and started to take out sheets of newspaper and placed them as a carpet over the floor. Having covered enough space around him, he took the bags that earlier had left over the clean seats and put them on the floor, over his perfectly set carpet and finally sat down. Anybody that has lived for some years in NYC is used to find the weirdest stuff in the subway, but here there was something else. He was not just another crazy guy in the subway… ok he was, but there was something interesting about his behavior. His psychological disorder, a phobia to germs and non-sanitized environments, was an extreme symptom of what I had seen many times in NYC subway. People using napkins to avoid touching the pole, parents freaked out about their children touching things or people in the subway, or people using too much hand sanitizer. It’s true that the subway system is not as clean as we would like it to be, but it is also true that there is a limit for sanitizing our environment. A phobia to germs, bacteria, viruses or any kind of invisible microorganism is at the end of the day a phobia to people, to social interaction and to public spaces. When swine flu psychosis took over, many governments recommended people to avoid touching, hugging, shaking hands or kissing others unless it was absolutely necessary. They even suggested not to leave home. It became common to see people wearing masks in the subway and though one could not know if they where being cautious or themselves were carrying the flu, it was certain that being out there on the streets, or in public transportation had become dangerous. Although it is clear that the Vietnam veteran who transformed his seat in order to be able to ride in the subway had probably an obsessive-compulsive disorder and mysophobia (the fear of germs), where should we draw the line about what is normal or acceptable concerning germs control? When do you stop being cautious and become a social misfit? Living in a city and riding the subway or any other vehicle of public transportation is not only about sharing space with others, accepting a certain social order, values and norms. It is also about interchanging microorganisms on a daily basis. These can make you sick, but can also make you stronger. 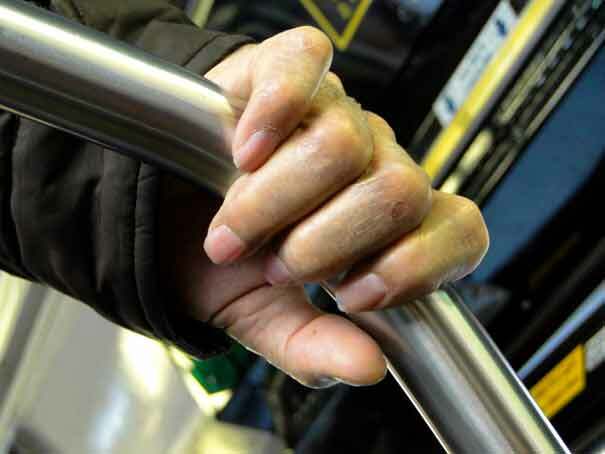 Not being able to grab the pole or using hand sanitizer every time there is physical contact with strangers or with public objects may not be mysophobia, but can be taken as a sign of social desadjustment or need for social seclusion. What does the Vietnam veteran and many others too aware of microorganisms need in order to commute without the fear of being infected? One possible answer could be psychological treatment or education. Unfortunately the most common solution for those who can afford it (and why not, may be the cause of their rejection) is to drive an automobile, a privatized mobile space with nothing else but germs of our one.